In November 2018 my latest book will be released. What’s it about?… well it’s huge. As an artist, it is my proudest exhibition to date. I have poured so much into this book. Adam’s story is so expansive, emotional and triumphant. I wanted to create a visual experience that kids would love and parents would love sharing. Art has the ability to go beyond describing something… it can ask us questions… and we can each have our own personal answer. There were two major goals that I really wanted to hit for this book. Firstly, I wanted all of us to feel. This book isn’t for those that feel invisible now. The story is too big to be just for them. We have all felt invisible at some point in time. Whoever we are. So this book is about us all and for us all. Secondly, I wanted the art to feel approachable, imperfect, fragile and delicate. It’s my artist statement. I could have aimed for realism but I wanted kids to see imperfections… to feel that imperfect is ok. I could have aimed for smooth lines… but there is something human about a wobbly line, about a slight gesture of colour that doesn’t quite belong, a shape that feels hurried. I am inspired by children’s freedom when they create art. I hope when people read this book they can feel a freedom in themselves. In the near future I’ll release an essay on this body of art, my intentions and thoughts behind the pictures. But for now I’ll leave it with this… I wanted this book to feel fragile and delicate. I wanted kids to see imperfections, to see colours that might not be naturalistic. Art is about interpretation and if a picture book is 51% made by the reader, I wanted the visuals to not only show a moment of the story…. but to make a moment for the reader. I have reached deep to try to create a feeling in the heart of the reader… because that is where our books are made. a place to feel seen. I love this picture. It’s one of my favourites from my picture book debut as an Author and Illustrator, Young MacDonald. I’m going to share with you the steps I took to create this image. Fortunately some of the steps I’ve recorded as videos and I’m super excited to be able to have them here so you can see how long it took me and how I used my materials. Over time you'll also see how I grow as an artist. That's the great thing about creativity.... you and I and everyone can get better at it! So if you are a keen maker of things.... keep a record of what you made and what you were thinking. You'll love looking back and finding little treasures and also seeing how far you have grown. Art is about decisions. So I’ll continue to share my thought process as I made this part in my book. Q - How am I going to fit the text and submarine and characters on this page? A - Well... what do we want to feel on this page? A - Um. This is the first time we see the submarine so we need to have lots of fun with that reveal. We also need to feel what it’s like to be in a submarine underwater and the sound it would make. We also need to fit the text in. 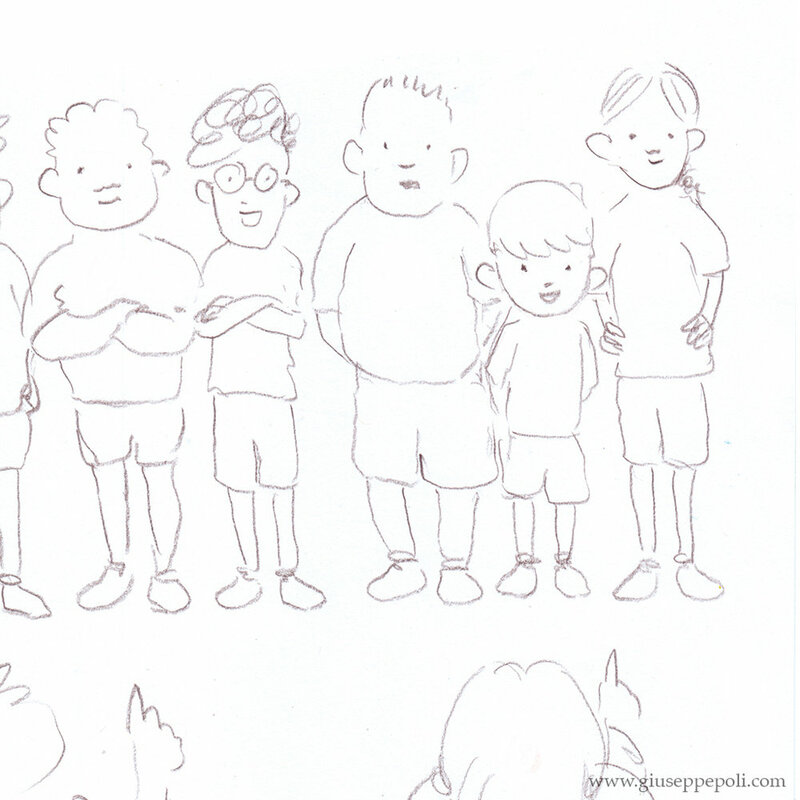 At this point in making the book, I was purely focused on quickly capturing ideas to see how the whole book would feel. I wasn't concerned about details.... just about feelings... especially how it would feel to read the page before, turn the page and see this page and then turn on to the next page. It's interesting to note.... I had no intention of publishing this book when I made this. It was purely to create a story from a desire and personal challenge to make something fun that my 2-3 yr old son would love to read. A number of years later a publisher was very keen to make this into a real book and so now I had more questions. Q - That previous image is very rough. What is the final image going to look like? A - Well that depends on what the whole book will look like... which is a daunting question. Let me just think about this page and start with this. I can change it later. As the development of the book progressed I realised that I wanted to bring more to the story without changing the words. Q - How can I make this image deliver what I now want in the book? A - I need to see the submarine.... but I also need to see their faces. We see the submarine first on the right page so I'll make the submarine bigger in the left page so we can get a closer look at the characters. I'll also just show the front of the submarine because then we are looking directly at them and I can also fit the submarine on that page because the submarine is too wide. This pencil drawing is still very rough. I knew that I was going to use black ink and a brush to paint the outlines and after some (actually lots of) previous experiments I found that I didn't need to make all the decisions in my pencil drawing. I also knew that I was happy with these sized pictures and that the text would fit around them on the page. Below is a realtime video of how long it took me and how I used my pencil drawing and a Lightbox to paint the outlines onto a new piece of paper. I'm not using any special paper here because I know I'm going to scan them in to the computer and I don't feel I need any extra texture in the brush strokes. Here is a realtime video of how I painted the outlines for this illustration. Q - So what does it look like now! Show me, show me. I need to see it to know if it still feels good. A - Ok ok. It's coming... just do the work. Now that I had painted the ink outlines, I scanned them into the computer and placed the text in. Here is what it looked like. This was a fun discovery... especially as I had progressed drawing the ink outlines for the pages that I had answers for. For some pages in the book I was still unsure. Fortunately for this page, I was. Q - ...but I need to see it colour! A - yes yes. That's coming. Colours create feeling. I already had some strong thoughts about the colours for this page. It was going to be full of colour and I was going to have more white space on the page before and after to create impact and a special moment for the characters and readers as the story unfolded. I'll continue this behind the scenes ... sharing another video on how I made the background and how this all came together. 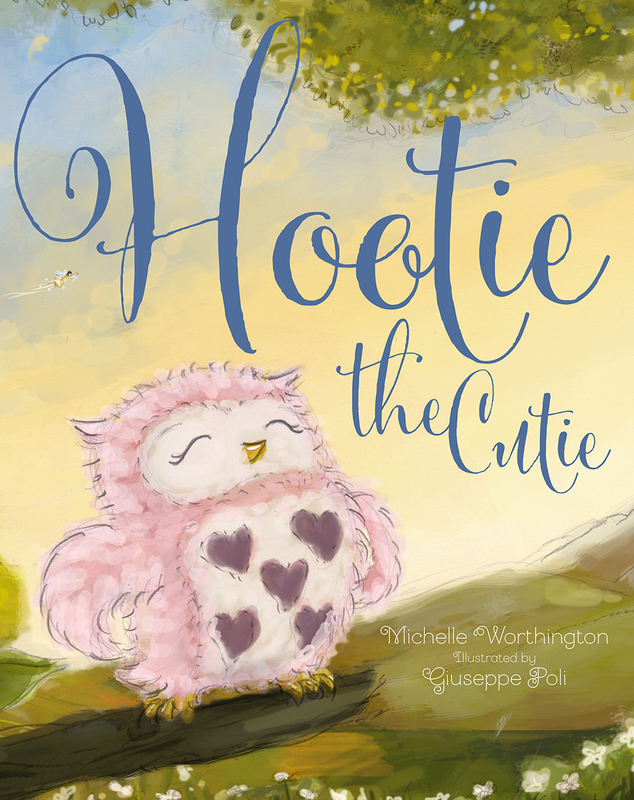 Hootie the Cutie, written by Michelle Worthington and published by New Frontier Publishing in 2014, was my first published book. I was so excited when I was contacted by Sophia from New Frontier... I didn't know how to respond! "Do I have time in my schedule?" was a question asked of me. Schedule? I didn't even have one! It was like suddenly by this small email I was invited over the wondrous wall that many aspiring Authors and Illustrators dream of crossing over into the 'garden-of-those-who-are-published'. And with this small email that monstrous wall - mysteriously thick, tenaciously unsurmountable and inconceivably impenetrable (it may seem to many aspiring people) - was suddenly a thin small line, that I had just realised I had now crossed. I'll never forget that day. So... why am I writing this? Well... I'm writing this for those who feel that wall is far more than a thin small line. I'm writing it for the little kids (and big kids) who dream of one day being an author or illustrator or artist. I'm doing it because people think what I do is magical.... and whilst I'm so grateful for their comments.... I want to reach out and say 'do you want to do this too?' and if they say 'yes'... I want to be able to help them and show them that it's not magic... it's just a whole stack of little steps in a long wonderful journey. Enough talk... it's go time. There is so much to share and I won't have time or space to do it in this one post... but I'll start and continue Hootie the Cutie over a number of posts. I can't wait to share some behind the scenes for Young MacDonald (my Author Illustrator debut) - I'll start that soon too. Hootie the Cutie was my first published book. I was scared of making a mess of it. I remember thinking to myself that this was going to be my business card... my portfolio. I also remember that I wanted to create an experience. I wanted readers to be pulled into this wonderful magical forest. I had two main things to figure out.... 1) design of the world and 2) design of the book. Question - How do I start? Draw something. Question - What should I use? You're going to make lots of mistakes. I drew most of these on the back of used paper with a HB pencil. My goal was to just create as many answers as I could. Question - What does Hootie look like? An early design. I was trying to answer scale. How do you make something look small? Put it next to something small... eg: lady beetles and a leaf. I liked the pose of this design but it didn't feel fluffy enough. Question - What does Hootie look like when she meets the Dragon? I wanted the Dragon to feel scared and lonely. I had this triangular face design that I then changed to the softer design. Question - What does Hootie and her father look like? Here are some early designs. These were based on an artwork I had made previously which the publisher really liked. I liked the designs. Hootie still felt too slick. Question - So if those are the designs, what do they look like in a pose? Here's Papa Owl trying to keep Hootie from something. Answers lead to more questions and so at this stage I was still feeling anxious. I really needed to answer... 'Why don't I completely like my designs for Hootie?' and 'What is the experience of this book?'. I'll share my answers in another blog post... because I've run out of time for this one. Thanks for reading. I hope you have found something in this. I'm really keen to share more. If you have any questions or requests let me know via the comments.